For the past few years the Ashram has opened to visiting groups for retreats during our quiet seasons. We appreciate hosting others for the inspiration and learning they bring, and for maximizing the use of our beautiful facilities. We find that each group, while focusing on their own program, enters easily into the flow of our daily life —often enjoying morning yoga, silent meals, satsangs and sometimes contributing through Karma Yoga. Coming up this spring, United Church ministers will arrive for quiet reflection time together; an Okanagan yoga teacher will be celebrated by family and friends on Mother’s Day; and some Toronto high school students and chaperones will be staying here during a youth exchange with our Crawford Bay School. 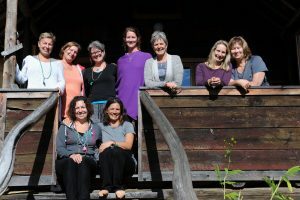 A group of “inner wild women” arrive from Alberta in June, followed by participants on a week-long leadership program through the Banff Centre. In the fall we look forward to welcoming back the New Denver contemplative group, the Corazon Youth Choir, and a group of yoga teachers and students returning for their third retreat. A Kimberly group is also gathering for a sacred dance retreat to be taught by an Ashram instructor (which is another option—to customize an Ashram-based retreat). We have hosted educational, interfaith, meditation, yoga, professional and music retreats as well as gatherings of families and friends. To explore bringing your people to the Ashram, please visit our website or email info@yasodhara.org.